My edit was easy... I picked three shirts straight away as I loved the detailing on each of the collars, and as they start at £69 they are far more reasonably priced than others in the market (J Crew, I'm looking at you - sorry). The sleeveless Sasha Jacket is also straight on the "I might die if I don't own it" list. I'd wear it with simple long sleeved high neck tops and jeans and heels. The cobalt blue corset and the black jumpsuit are brilliant for sprucing up my weekend outfits, and really don't need much else other than my basics to go with them. 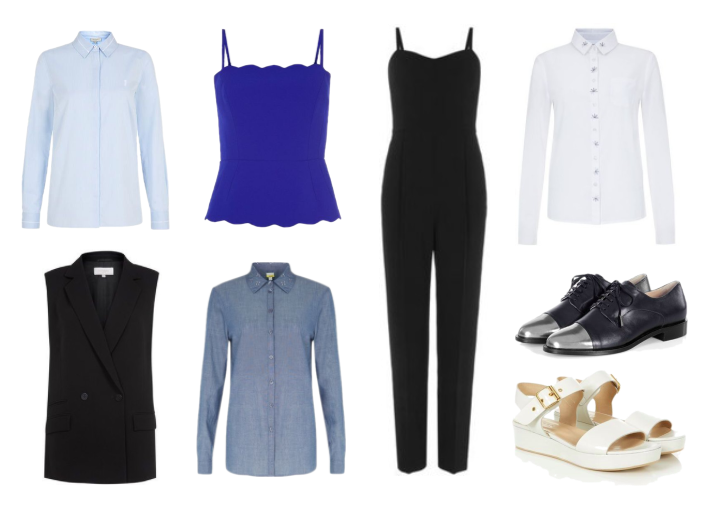 I'm so glad that cobalt is hanging on for SS14 too with Hobbs, most brands have cut it out and it's my favourite colour. And last but really, really not least is their footwear - which was a discovery for me last season when I bought a pair of brogues - here are this season's update on them. I can't wait for spring so these Selma Sandals can get an airing - and for £129 they are about £500 cheaper than the Mulberry, Celine and Comme des Garcons similars. Selma sandals are on my wish list too!